Today is All Souls Day, a day of remembrance for friends and loved ones who have passed away. 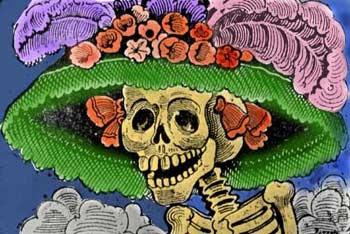 Not celebrated with much fanfare in the States, but in Mexico it is celebrated as El Día de los Muertos, Day of the Dead. Actually, El Día de los Muertos covers both All Saints Day and All Souls Day. 1 November one prays for the infants and children that have passed over and 2 November is reserved for the adults. I spent El Día de los Muertos in Oaxaca one year and it was quite a party. We built altars offering up food and drink to the dead. We bought sugar skulls at the market and visited the cemetery where families gathered to have a meal with their loved ones, both living and dead. 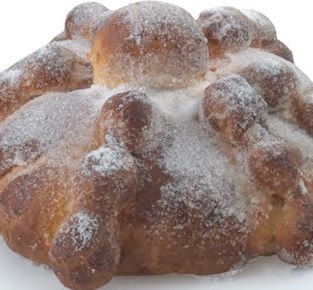 A staple of the holiday is the Pan de Muerto, a sweet bread, shaped like skulls and bones and decorated with sugar. In a another bowl combine the eggs and the water. Add the egg/water mixture and another 1/2 cup of the flour to the sugar mixture. Add in the yeast and another 1/2 cup of flour. Continue to add the flour 1 cup at a time until a dough forms. When the dough is doubled, punch it down. 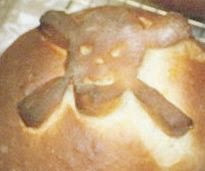 Use 3/4 of the dough to make a round or skull shape. 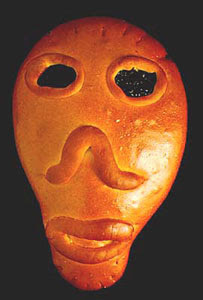 Use the remaining dough to make bone-shaped decorations. You can also divide the dough into smaller pieces and create bone-shaped small loaves. Let the shaped dough rise for 1 more hour. Bake in at 350F 30 minutes for smaller loaves and up to 45 minutes for larger loaves. For the glaze, bring the orange juice and sugar to a boil. When it has cooled a bit, brush on the bread. Sprinkle with additional colored sugar, if desired. I love the festive playful side of this true tradition. In France, the remembrance is what counts so families get together to clean and flower the tombs of loved ones. In the US the playful side is what counts. Both sides are important. Mexicans know how to do it!